Corbett Wildlife Tours - Wildlife and tiger safari in dense jungle. 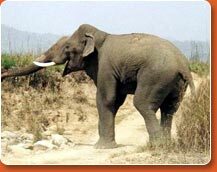 Jim corbett is in Uttranchal district of north india and very near to nainital hill station. This wildlife reserve is well known for vide variety of species of animals and birds. Both jeep and elephant safari is available for wildlife trails. Tiger safari is the main attractions of this park. Normally park is open for tourist from October to June. many famous luxury hotels and resorts are there for comfortable stay over there. Fishing in Ramganga river is also major attractions of the reserve. 6 days corbett tours start from delhi and ends at delhi. In Early morning arrive from your country to Delhi. On arrival, meeting with our repesentative and after that transfer to already occupied room in Hotel. After taking breakfast, going to sightseeting tour of Old & New Delhi. which covers main attractions like heritage monuments, temples etc.. Delhi is also famous for shopping in local market. On arrival, check and stay at corbett jungle resort. After taking Breakfast, going to Nature Walk to the Jungle for wildlife viewing and sightseeing. 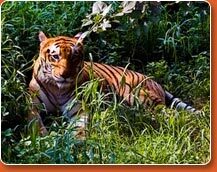 Corbett is famous for wildlife and tiger safari. Overnight at Resort. On 5th day walk early in the morning and after taking Breakfast, We are going to Nature Walk to the Corbett Jungle for wildlife viewing, Bird Watching and for other Activities.